I’m professional artist and art educator. 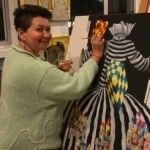 The creation and refinement of my unique style has been something I’ve spent decades perfecting my craft and unique style with its whimsical humour, textural sensitivity and vibrant sense of colour. Although I’m a current resident of Sydney, Australia, I was born and raised in Omsk, Russia. As a result of this mixed culture, my aim has been to blend my eclectic background in European art, experiences, and classics with the fresh Australian colours of both life and nature I’ve come to find .